Don’t be limited by the designated dimensions of your kitchen. Not everything that’s traditionally found in the kitchen necessarily needs to be there. Much of your crockery, utensils, appliances and accessories can be stored in neighboring areas to maximize kitchen space. This works particularly well if your kitchen is an open concept one or adjoins the dining area. Sideboards near the dining table make easily accessible storage spaces for cutlery, serving crockery and entertaining accessories such as napkin holders or table runners. In fact, think out of the box. An interior designer I know took the refrigerator out of a small kitchen and into a built-in space in the dining room to maximize kitchen space and gave the home a boldly innovative touch. There’s no such thing as too much countertop space. Even if you start with plenty, appliances or kitchenware will eat up your work spaces faster than you can fry an egg. One solution to maximize kitchen space is get a pull-out table on wheels; it multi-tasks as an extra preparation table or breakfast bar, and can be tucked away when not needed. If possible, get a designer’s advice on where to include one – if used for chopping or cutting, it should be near the sink and hob, yet not impede traffic flow. The solid surface countertop above slides open to reveal the cooker hob. Everything else is stashed away in the white built-in cabinets, making this contemporary kitchen look neat and sleek when not in use. 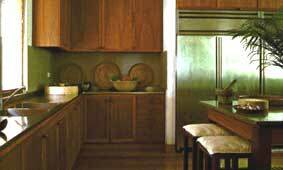 For more countertop relief, consider mounting appliances such as microwave ovens on the wall. They can sit on open shelves, or be hidden behind cabinet doors for a clean, uniform look, chopping boards that fit over sinks or the flat surface of an electric hob (when not in use) can also double as prep space. 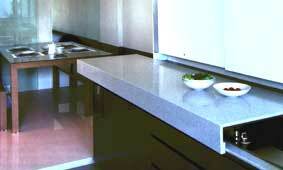 To stretch countertop areas even more, ruthlessly relocate everything except everyday-use appliances into cabinets. Not only will this give you more working room, the uncluttered appearance will also amplify your actual space and make it easier to find things. Walls, cabinet doors and sides of cupboards can be surprisingly useful as storage areas. Instead of trying to cram the next utensil into your overflowing drawer, install rails or hooks on the wall or under cupboards to maximize kitchen space. 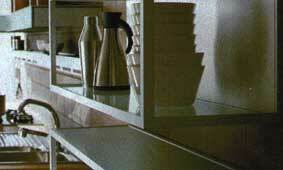 The picture below shows how you can use open wall-mounted shelves to turn everyday items into sleek display pieces. Hanging up your cooking implements not only makes grabbing them a cinch (no more rummaging at the back of the bottom drawer), they can also inject visual interest on otherwise plain walls. Spice racks, in particular, add color and character to a kitchen, and are light enough to be mounted on most cabinet doors. Large decorative plates that fit awkwardly in cupboards can be beautifully displayed in inexpensive wall-mounted dish racks. If you have a high ceiling in the kitchen, milk it to the fullest. A custom-made rail for hanging wine glasses or mugs can make a stunning mid-air attraction, and save you considerable storage space. 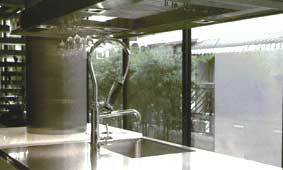 For the example below, a sleek overhead canopy above the basin incorporates a drying rack and wine glass storage. Don’t forget the external sides of cabinets or the inside of pantry doors; these are perfect for hanging oven mitts, dish cloths and light gadgets. A word of caution — whatever’s within eyeshot should blend well with your overall design. 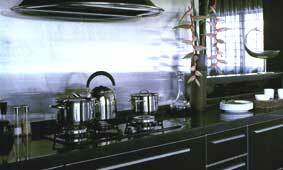 If stainless steel surfaces are the order of the day, complement them with sleek metal rails and shiny pots. Don’t string up a mismatched assortment. The visual clutter will give you a headache! The soothing mix of wood and stone is consistent throughout the kitchen above and complemented with the wooden plates, trays, stone grinder and bowls. Steel sculptural trays and humble condiment containers in glass and metal are stylishly coordinated with sleek, contemporary kitchen furniture (above). In addition to above, you can get more space-saving solutions with kitchen cabinet storage ideas or get your kitchen organized with home organization tips. Click to return to the top of maximize kitchen space.